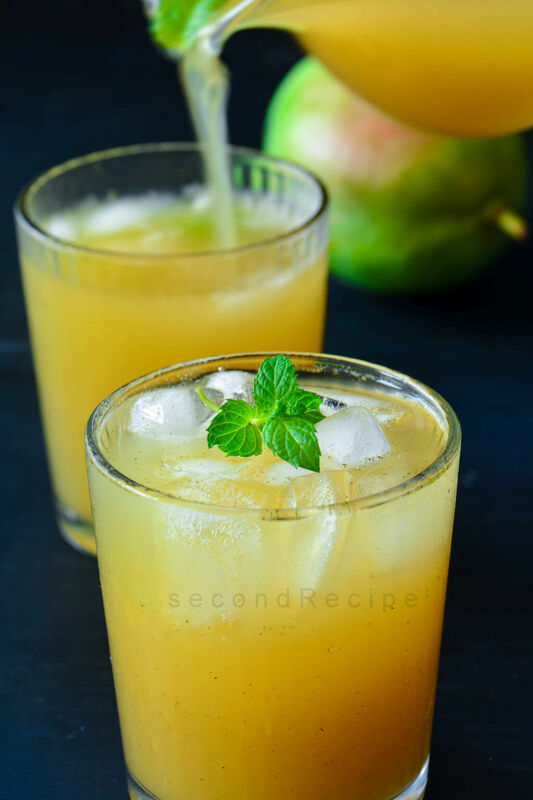 Aam Panna- Raw mango cooler is an integral part of Indian cuisine. Reminds me of summer fun.Great recipe to use the green mangoes falling off our trees. We would also pluck it from the neighbours’ garden after asking them. Mom made loads of this for me when I was at hostel.It helped me survive the heat and get some touch of motherly love. This recipe is as close to my heart as much as mangoes are.Hope you relish this as much as I do.It instantly cools the system.It is also full of vitamins.Please remember to store it in fridge once bottled. Steam mangoes for 25-30 minutes till they completely become mushy. Mix spices,jaggery,salt and blend into a smooth puree. Store in a dry glass bottle in a refridgerator. To serve: Mix 2 tbsp of aam panna in a glass of water and serve with ice cubes. Click here for more drinks. Finally, click here for more recipe videos. Sure do try and let us know the feedback.